After paying 14,000 research participants all over the world on behalf of 300 UX researchers and their teams, thought we’d share some lessons learned to help you treat your participants right. A researcher’s job entails a thousand things besides considering the post-session experience of participants. Even if a research operations team has the luxury of paying high incentives, they’re usually paid with the most readily available methods to the organization. But with the exploding industry of virtual rewards, gift cards, virtual currencies, and AMAZON IN SO MANY COUNTRIES, there are more options than ever if you’re ready to ditch the stack of plastic cards in that one desk drawer. Some of these new payment methods are awesome, and some could use a little help. We’ve tried them all, so let’s dive in. Unless you’re doing a blind study, your reward emails and redeem pages should reflect your brand and be consistent with the communication they received before and during their session. This also helps with phishing concerns. Never send your participants an electronic reward without knowing the number of steps they have to go through to get their money and spend it. Many virtual providers will force your recipients to create accounts, create a virtual “wallet,” and other tricks all geared towards making it harder for people to spend all of their money. If you’re using a platform or agency that will be taking care of incentives for you, ask for documentation or screenshots of what it’s like for recipients to get paid. If you can take care of the incentive as close to the end of the session as possible, you’ll probably get less frantic all caps emails asking about incentives, as well as having one less thing to do. In some cases, physical cash, food, cards, or products are necessary, but most times electronic is quicker and doesn’t come with fees. Electronic is viable for in-person research and can also be a good experience. Just ask participants to hold on briefly while you issue their reward and they can usually verify they got the email on their phone. Especially for higher dollar amount rewards for professionals. Ethnio partners with leading global charities to help make an impact. Make it clear this isn’t a scam by using a real name or reply-to on your emails with incentive information, and provide links to information about your research team or organization. Yes, phishing emails do the same thing sometimes, but your links will be real. Much harder. Currencies, languages, and even expectations vary much more around the world. If you’re in a regulated industry or doing research with kids or any other group with special protections, take the time to understand any restrictions on payment methods before it’s time to pay up. Offering Multiple Incentive Options: Why Bother? In October of last year, we introduced the option for researchers to offer multiple payment methods including eGift cards, PayPal, Amazon, and more. These options are easy to redeem, usually requiring participants to simply verify their email and choose a method. Not only did this allow us to reduce our fees for higher volume customers, but it also led to an explosion in satisfaction from the participant side of the fence. People absolutely love having a say in how they get paid. Imagine that. 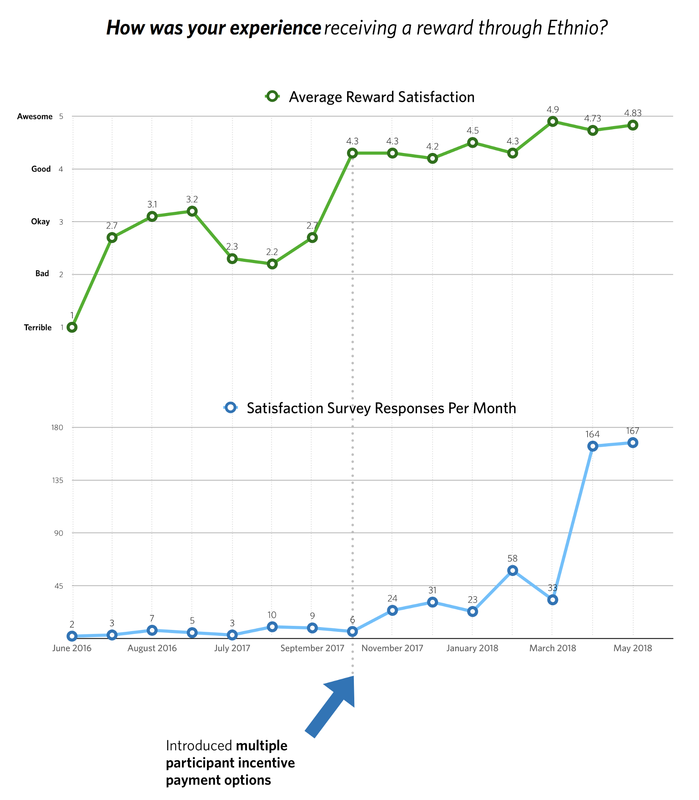 Shown below are the results of a simple survey we run on incentive participants where we ask “how was your experience receiving a reward through Ethnio?” Participants can choose from a 1 through 5 point scale ranging from terrible to awesome. The graphs below represent 545 Responses between June, 2016 and May, 2018, and you can see the volume of responses and satisfaction shot through the roof. These 545 respondents were about 71% in the United States, followed by Australia, Canada, and India all being about 3–5%. The rest were scattered all around the world, except of course countries that are restricted. Very little data exists in one place about how participants spend their money after they receive a reward. Most researchers just don’t have time to think about it, and companies like us rely on a system of banks and providers to deliver the money. 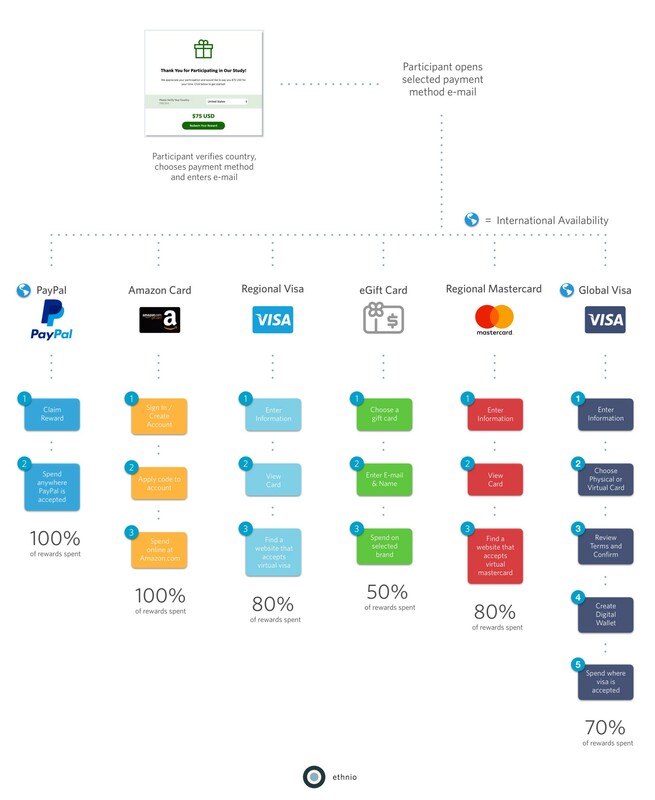 Below is our estimation on how many steps a few key payment methods take, and the percentage of each reward that generally gets spent. For example, if you receive money via PayPal, you will almost certainly spend 100% of that eventually. But if you get a virtual gift card, you may forget to spend it, or only spend a small percentage of it. Please note, the percentages in the table below are based on nothing more than estimations based on our experience. 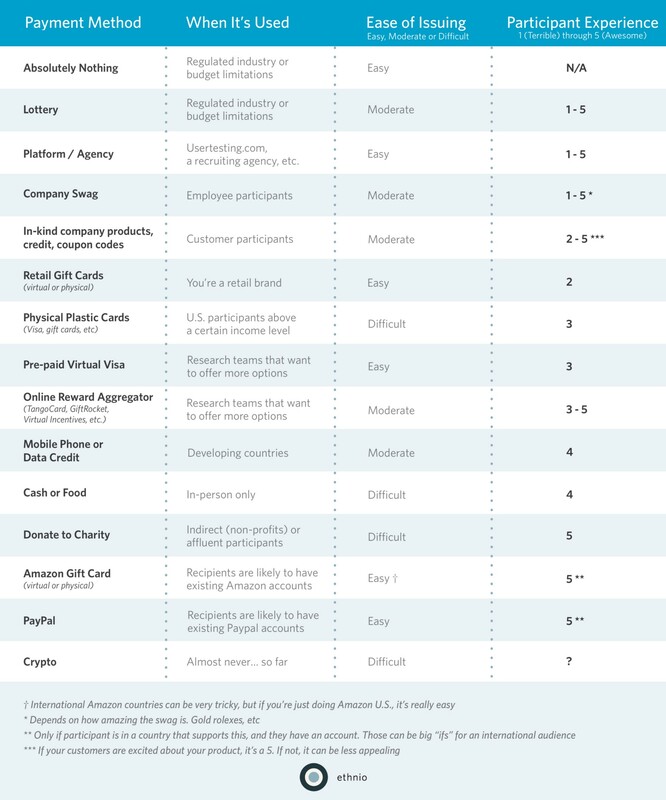 You might be wondering which payment methods were the most popular over these 14,000 incentives. Turns out Amazon U.S. was by far the most popular with 80% of paid incentives. However, this isn’t really fair because we only offered one or two payment methods for a long time. Upon measuring the most recent months, PayPal is quickly gaining momentum and Amazon International rewards are creeping up very quickly. For a long time its been difficult for researchers to pay participants in foreign countries with Amazon gift codes since international Amazon websites operate within country specific domains and languages. In some countries the process of issuing incentives can be relatively easy, while in others it can be near impossible, even with Chrome auto-translate turned on. Ethnio now offers researchers the option to seamlessly issue Amazon gift codes in the following countries: Japan, Germany, Canada, France, India, Netherlands, Italy, Spain, and the UK. Government users, strict finance companies, employee participants — there are a million reasons why some researchers just aren’t allowed to pay incentives. When that’s the case, CHARITY. Ethnio partners with leading U.S. based charities, many of which operate on a global scale, to allow domestic and international participants to donate and help make an impact. We’re launching with the charities seen below, and hope to partner with many more in the future. Participant Incentives Experience. Organizations should continue being mindful of the entire user experience when conducting research including the final steps of paying your participants. While offering multiple payment methods is only a starting point in our roadmap, we believe there are far more undiscovered user needs that can be addressed. As virtual rewards and even digital currencies are skyrocketing in accessibility and popularity, who knows what the future holds for the incentives game? But wait, how much should pay you actually pay your participants? That could be a whole other topic. Stay tuned. Also put this article over on medium, if you're into that sort of thing.